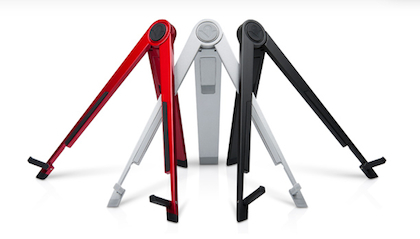 Red, Black and Silver – the folding Compass iPad stand comes in colors now! The title of the post is a mouthful, but hopefully a day at the office will be less words as people have been grabbing each other’s iPad stand. The folding Compass stand from TwelveSouth was popular around our group from the day it was first introduced. The problem was that it only came in silver so everyone’s looked the same. Not any more! TwelveSouth has introduced a couple colors to go with the default silver. Now, available in Red and Black. All three look professional, open/close quickly and they fit into the smaller iPad carry bags. The Red looks pretty good on the kitchen counter too!